MONTREAL, Quebec, Canada, January 23, 2002 (ENS) – A stream of toxic chemicals flowing down the St. Lawrence River “shocked” citizen environmental investigators Sunday morning. Members of environmental groups Société pour Vaincre la Pollution (SVP) and the Environmental Bureau of Investigation (EBI) found the slick during what the groups call “a routine investigation” at the Technoparc Saint Laurent, an advanced technology research park situated on an old hazardous waste site in Greater Montreal. Polluntants photographed in the St. Lawrence River Sunday (Photo courtesy EBI)The slick was estimated to extend 400 meters (1,300 feet) down the St. Lawrence River from the waste site, situated next to the Victoria Bridge, less than two kilometers (1.24 miles) from downtown Montreal. Mark Mattson, executive director of EBI, and SVP executive director Daniel Green immediately called Environment Canada’s 24-hour emergency hotline for pollution and spills. “Environment Canada has known about this site for years,” says Green. Historically, the site was used to bury domestic and industrial waste until 1966. It was then covered with asphalt to be used as a parking lot for the Expo ’67 World’s Fair. Until 1972, it was used as a small city airport. The city of Montreal assumed responsibility for the Technoparc site in the 1980s and decided to develop it into a park dedicated to research in advanced technology – the 30 million square foot Technoparc. It was during the summer and fall of 1988 that Green first noticed a continuous flow of hydrocarbons and toxic wastes into the St. Lawrence River from the old landfill site under the Technoparc. Samples taken from the St. Lawrence River during earlier investigations at the Technoparc reveal PCBs discharging from the site at levels measuring 368 parts per billion – hundreds of thousands of times government guidelines, the environmental groups say. 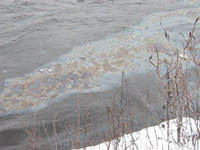 Federal laws such as the Fisheries Act prohibit the discharge of toxic PCBs into waterways like the St. Lawrence River. PCB contamination of the St. Lawrence River has affected the resident beluga whales and has made eating fish from river a public health risk.